Bathsheba Everdeene (Carey Mulligan) is a rare thing - an independently wealthy woman living in rural Victorian England. Her financial position frees her of the need to marry for security and "position". She only wants to marry for love. This makes her a mystery to her three suitors - the steady farmer, Gabriel Oak (Matthias Schoenaerts), the wealthy William Boldwood (Michael Sheen) and the flashy soldier Sergeant Francis Troy (Tom Sturridge). Will Bathsheba make the right choice? Join The 500 Day Of Film Club Today! Just Clickity Click This Ole Button Here! 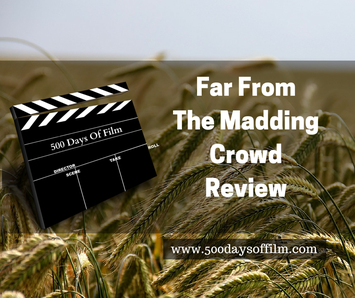 I went to see Far From The Madding Crowd in the cinema and was so impressed by the look of the film. The cinematography in this film is gorgeous. The movie is lit in a really magical style and has none of the mucky feel of Wuthering Heights, for example. I wasn't unhappy about that as I do like my rural films to be clean and tidy (I get a bit twitchy about dirt) but I did wonder if this sense of cleanness and the almost clinical tone to the film made it somewhat lacking in passion. It is not that I didn't enjoy Far From The Madding Crowd. I thought the four central performances were superb - Mulligan and Sheen are particularly strong. The story is (obviously) a classic. I have read this Thomas Hardy novel but, when watching the film, I couldn't for the life of me remember the ending. So, I was both intrigued about and eager for the conclusion. When it came, it just felt oddly unsatisfying. I am trying, now, to figure out why this is - the story is a classic, the film looks gorgeous and the performances are all strong. I just keep coming back to passion. In the end, I didn't feel any and, despite enjoying the film, that felt like a problem. Carey Mulligan is fast becoming one of my favourite actresses. Why do I find it so hard to criticize a film? I would really rather be relentlessly positive. However, I do feel that I should be totally honest. I may not be right, I may change my mind but I still feel that there is something honorable about telling the truth about a film as you see it at the time.